For all the time and money we spend attracting customers to our website, isn’t it odd how little we spend trying to convert them? 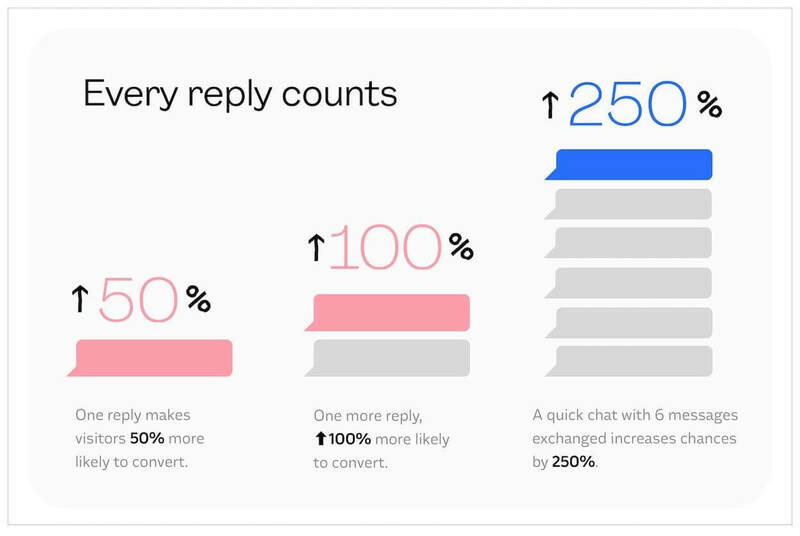 These live chat stats will show you the conversion power of messaging. According to an eConsultancy report, for every $92 spent acquiring prospects only $1 is spent converting them. Sure, that dollar could give you returns in spades, but in reality the odds of that are no better than a craps table in Las Vegas. The average conversion rate for your typical marketing stack – things like forms, paid advertising or mass email – hovers around the 2% mark. The report is a bit dated, but the underlying thinking persists: companies still spend disproportionately on top-of-funnel acquisition and neglect conversion rates down the funnel – and that’s where live chat comes in. To paraphrase Tom Goodwin, isn’t it odd that we’ll spend billions of dollars trying to have a conversation with consumers, and in the rare moment we do, we consider it too expensive? Perhaps that’s because the value of having these conversations isn’t clear. 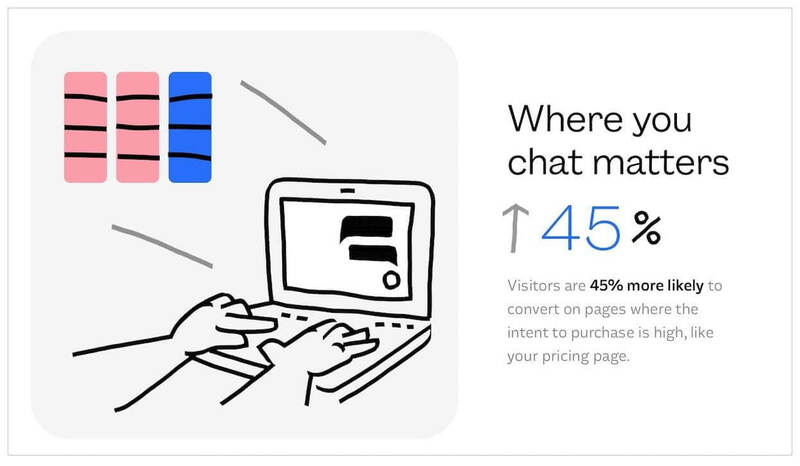 To establish that value, we analyzed an aggregate dataset of 20 million live chat messages sent through Intercom to demonstrate the potential for live chat as a channel for converting visitors and driving actual revenue for your business. 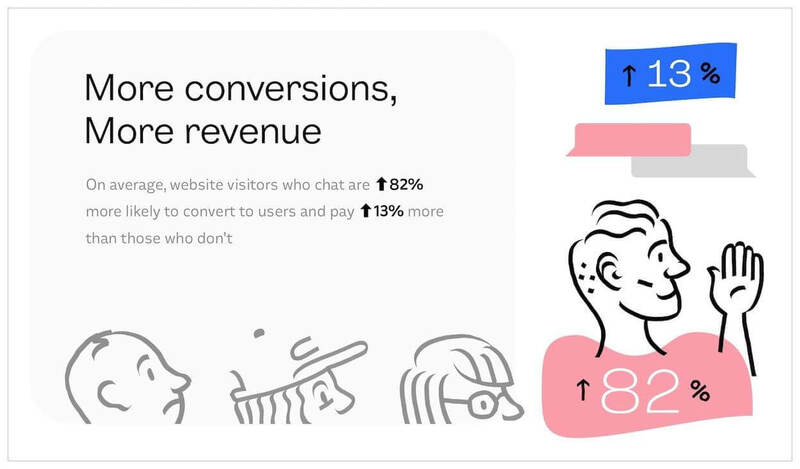 Here are 11 stats that speak to the conversion power of live chat (or scroll down for the full, embeddable infographic). Having conversations with your website visitors really does pay off. According to our data, website visitors are 82% more likely to convert to customers if they’ve chatted with you first. What’s more, their accounts are worth 13% more than those where the business didn’t have a conversation before sign up. Leaning into real-time conversations isn’t just a nice-to-have, it’s great for capturing and converting website visitors too. Key takeaway: Live chat is a powerful (and underrated) channel for converting visitors into valuable customers. When someone visits your site, they’re more receptive to chatting with a salesperson than, say, when they receive an unsolicited LinkedIn message. A common misperception about live chat is that effective conversations need to be long and time-consuming. On the contrary, a quick, real-time connection makes a big difference. We’ve found that just one reply in the messenger can increase the likelihood of conversion by 50%; one more reply makes that visitor 100% more likely to convert. A simple conversation with 6 exchanged messages makes a visitor 250% more likely to become a customer. Key takeaway: Live chatting for business isn’t like chatting with a good friend, but the more you chat, the more likely you’ll convert them. Don’t assume your homepage is the only place to install a messenger. According to our data, visitors are actually 45% more likely to convert on pages other than the homepage. Key takeaway: Think about the visitor’s motivation for visiting a certain page and where they’re most likely to need a real-time response. Perhaps that’s on your pricing page when they are trying to choose between options, or perhaps it’s on a promotional landing page when they’ve clicked on an ad and are trying to figure out how your product fits their needs. The best chatbots are like an SDR’s secret personal assistant. They streamline their jobs by taking on repetitive tasks, i.e. booking meetings, collecting lead information and suggesting help articles, so the SDR can focus on higher cognitive tasks. 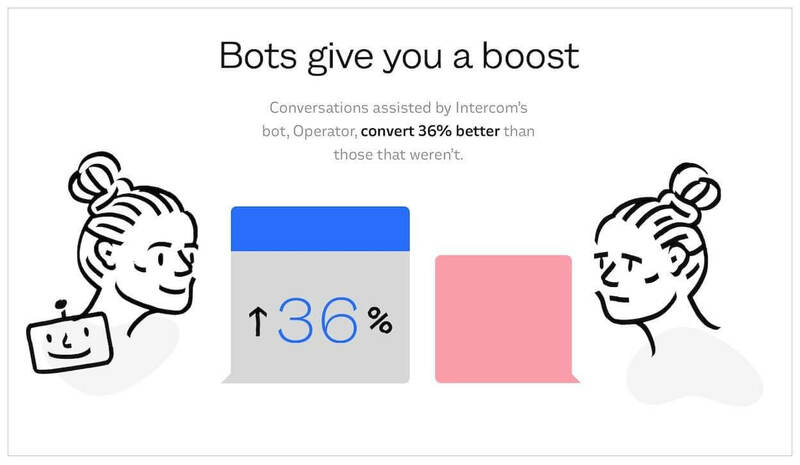 Indeed, our data shows that conversations with bots convert 36% better, likely because a bot can respond faster than humans for most repetitive tasks. But in our opinion they they should never pretend to be humans, nor should they completely replace humans, who are still more efficient at converting leads into customers (amongst other human-y things, like sensing low-level rage ?). Key takeaway: Humans and bots make a lean, mean sales machine. But ultimately, humans are still better than bots for qualifying leads and shouldn’t replace them anytime soon. Live chat bridges the gap between the personal, timely service that makes us loyal customers in real life with the extensibility of software and the ROI of automation. Tradeshift’s sales team increased sales opportunities by 32% with our live chat. At Salesloft, Intercom drives 40% of sales demos booked, an 8X improvement over their previous live chat tool. 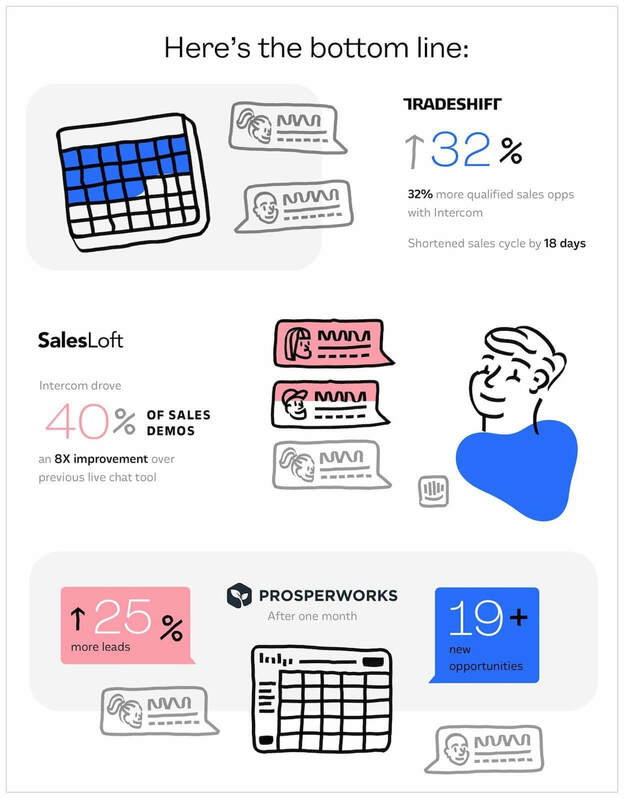 After one month with Intercom, Prosperworks achieved 25% more leads and nearly 20 new opportunities. Thanks to intelligent automations such as conversation routing, CRM integrations and chatbots, live chat is on the cusp of being the most efficient way to capture and convert leads.